In addition to trekking out to the festival, and despite some killer allergy symptoms that joined me Saturday, there was quite a bit of knitting. 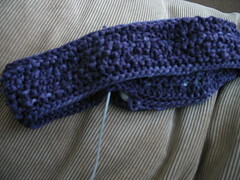 Then, having fun with the yarn, I cast on for a headband much like the To Have and To Hold one featured on "Knitty Gritty". I cast on before I did my festival planning pattern sorting, so I thought I didn't have the pattern handy (oops) so I made one up, using garter, garter double wrap, and woven stitches. 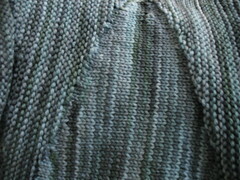 I intentionally knit it a bit narrower than the player, figuring the stretch would compensate for that. This may come back to bite me by causing the headband to stretch faster. We shall see. I tested it out yesterday and it worked nicely. My player is on the bulkier side, but I have thick enough hair that it covers the bump pretty well. If you have finer hair, you may want to wear your hair up so as to clarify that the bump is not a strange growth. And I also made some progress on the Queen of Cups. Note the lovely stitch marker! I did a little work on the Queen Lilu'uo wrap (pareo? ), but it looks pretty much the same. And then, overcome by the yarn fumes - or was that just the sinus headache? 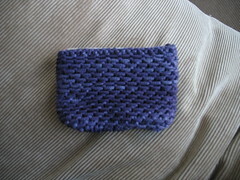 - I had to do something with the Brooks Farm Yarn. So. 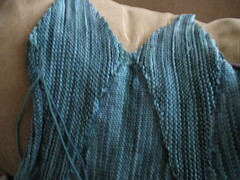 I cast on for the W tank - from Knitty. I love this pattern! 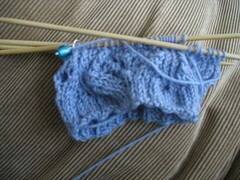 For some reason, knitting in this manner seems to make the progress more visible, it's very reassuring. The pattern is beautifully written (I had a brief brain freeze trying to figure out the transition to the last wedge for side one, but I think that was me more than anything. Even though I took both these pictures with just natural light, the close up is a better representation of the color way. This Solana yarn has been great to knit with. I went down several needle sizes to make a tighter fabric, but I still think this will likely require a camisol underneath. (Not a problem.) And the yarn (and the tank) is so pretty. I am starting to think this project would be a great first knit. I love the tank and can't wait to see it finished. p.s.I'm almost done with my Rusted Root-- just have to weave the ends in! !